The N-type voltage-gated calcium channel (CaV2.2) plays crucial roles in pain transmission, making it a tantalizing therapeutic target. Blocking the channel directly, however, produces profound side effects. Last week, researchers reported a subtler strategy: They inhibited channel activity by thwarting the interaction of CaV2.2 with collapsin response mediator protein 2 (CRMP-2), a protein that facilitates proper trafficking of the channel to the cell surface in neurons. The investigators, led by Rajesh Khanna, Indiana University, Indianapolis, showed that a cell-permeable peptide derived from CRMP-2 disrupted channel activity in cells, and alleviated pain in an assortment of neuropathic and inflammatory pain models in rats. The results were published online in Nature Medicine on June 5. Based on rodent neurobehavioral tests thus far, the peptide has a squeaky clean side effect profile when administered at analgesic doses. As a result, inhibiting the CaV2.2–CRMP-2 interaction—either with the peptide or with some other agent—may offer a promising new route to pain therapy. CaV2.2 is involved in neurotransmitter release from presynaptic terminals at multiple points along pain pathways. One CaV2.2 blocker, ziconotide (a synthetic version of ω-conotoxin), is used to treat pain, but that drug causes severe side effects, including hypotension, memory loss, and ataxia. Nonetheless, Khanna was convinced that CaV2.2 could be a good target for pain treatment. Even a little bit of inhibition ought to go a long way, he said, because previous results have shown that “miniscule changes in calcium can lead to tremendous changes in transmitter release—which means the physiological function of the cell, and the body, is going to be dramatically affected.” So rather than obstructing the channel entirely, Khanna hoped to find a more nuanced approach to modulating its function. CRMP-2 seemed to be just what he was looking for. “It was in the right place, at the right time, in the right neurons,” Khanna said. “Most importantly, it had an effect on the activity of the channel.” In previous work, Khanna and others had identified CRMP-2 in a screen for proteins that interacted with CaV2.2, and they discovered that CRMP-2 regulated CaV2.2 activity. Overexpression of CRMP-2 increased expression of CaV2.2 at the cell surface of neurons, enhanced calcium currents, and augmented the stimulus-dependent release of the neuropeptide calcitonin gene-related peptide (CGRP) from dorsal root ganglion (DRG) sensory neurons (Brittain and et al., 2009; Chi et al., 2009). In the current study, first author Joel Brittain and colleagues set out to obstruct the CaV2.2–CRMP-2 interaction using 15-amino acid bits of CRMP-2. One peptide, CBD3 (from CaV-binding domain 3), bound CaV2.2 in vitro and prevented it from interacting with CRMP-2. Expressing the peptide with CaV2.2 in neuronal cells prevented the channel from trafficking to the plasma membrane and led to a decrease in Ca2+ currents. A modified peptide, in which CBD3 was fused to the TAT domain of HIV-1 (TAT-CBD3), was cell permeant and reduced Ca2+ influx in cultured DRG neurons. In spinal cord slices, TAT-CBD3 reduced capsaicin-evoked release of CGRP from sensory neurons and inhibited synaptic transmission in dorsal horn neurons. In rats, the peptide blocked capsaicin-induced, CGRP-dependent changes in meningeal blood flow (a model of migraine mechanisms), indicating that it was capable of inhibiting sensory neuron responses in vivo. The researchers then went on to see what the TAT-CBD3 peptide could do for pain. They found that the peptide reduced pain-related behaviors in rats after formalin injection to the hind paw (a model of inflammatory pain) or capsaicin applied to the eye (a model of acute pain). The peptide also showed efficacy against a model of long-lasting, painful neuropathy, caused by the AIDS drug 2’,3’ dideoxycytidine (ddC): Intraperitoneal injection of the peptide seven days after an injection of ddC reversed tactile hypersensitivity. Pharmacokinetic experiments revealed that the injected peptide made it into the DRG, spinal cord, and even the brain. Nonetheless, at doses that reduced pain, TAT-CBD3 produced no ill effects in tests of motor function, spatial memory, and anxiety-associated behaviors. “This is now at a level where we’ve done some serious preclinical work to show that [TAT-CBD3] is effective in a variety of pain models... It’s pretty exciting,” Khanna told PRF. He and his collaborators are continuing to test the TAT-CBD3 peptide in additional pain models. They have recently seen evidence that it can protect neurons from the effects of stroke and traumatic brain injury, and Khanna says he is also interested in testing its effects on chemically induced itch. The researchers are also turning to the tactical question of what compound would be best suited to disrupting the CaV2.2–CRMP-2 interaction in clinical practice. Khanna notes that peptide therapeutics are expensive to synthesize and tend to get degraded in vivo. To get around that problem, he is collaborating with co-author Samy Meroueh, a chemist and computational biologist who is also at Indiana University, to design small-molecule peptidomimetics that could reproduce the activity of the TAT-CBD3 peptide. Suppression of inflammatory and neuropathic pain by uncoupling CRMP-2 from the presynaptic Ca(2+) channel complex. Brittain JM, Duarte DB, Wilson SM, Zhu W, Ballard C, Johnson PL, Liu N, Xiong W, Ripsch MS, Wang Y, Fehrenbacher JC, Fitz SD, Khanna M, Park C-K, Schmutzler BS, Cheon B M, Due MR, Brustovetsky T, Ashpole NM, Hudmon A, et al. Nat Med. 2011 Jul; 17(7):822-9. Epub 2011 Jun 05. This is an intriguing paper. The data suggest that pain sensation can be decreased by indirectly modifying the function of voltage-dependent calcium channels by altering the interaction of the main pore-forming subunit with a newly-recognized accessory protein, CRMP-2. As noted in the paper, Cav2.2 calcium channels are a promising target for treating pain, as shown by the efficacy of the calcium channel blocker Prialt (ziconitide), which blocks the pore of the channel and when bound completely inhibits its function. The idea that pain sensation can be affected by less direct alterations of calcium channel function by targeting accessory subunits that control expression and trafficking of Cav2.2 is supported by the efficacy in some pain patients of gabapentin (Lyrica), which targets a different accessory protein of the calcium channels (alpha2-delta) and presumably alters channel expression at synapses. Identifying a new molecular target that might work in this way is a major step. A remarkable and very surprising aspect of the results in the paper is the speed with which the effects occur. In principle, one might expect that an intervention that works by altering cellular trafficking or plasma membrane expression of ion channels might take many hours to have its effects. Yet, in several of the protocols used in the behavioral assays, the effects on pain-associated behavior were present very rapidly - just 30 minutes after applying the TAT-CBD3 peptide to the paw or 5-30 minutes after applying the peptide to the cornea. This speed is all the more remarkable if the peptide is acting by altering the expression of Cav2.2 channels in the central terminals of the primary nociceptors, since it would imply an extremely rapid time-course of a sequence of events including uptake of the peptide into the neuron, diffusion or transport to the central terminal, and rapid alteration of calcium channel expression once in the central terminal (or possibly the cell body). In support of very rapid uptake, the authors offer data showing the presence of fluorescently-labeled peptide in the cell bodies of DRG within 15 minutes of peptide injection. The effects on calcium channel expression are apparently equally rapid, which would imply a high turnover rate of plasma membrane calcium channels. Alteration of surface expression within minutes seems surprising. However, it is certainly not impossible. There is the precedent of rapid alteration of surface membrane expression of post-synaptic glutamate receptors, which can be inserted and removed from the plasma membrane on the time scale of minutes under some circumstances. Many important questions remain about the mechanism of the effect of the TAT-CBD3 peptides. The treatment is proposed to result in diminished expression of Cav2.2 channels in the presynaptic membrane of nociceptors, and will be interesting to see just how much this expression is diminished. Remarkably, peptide application was found to completely abolish plasma membrane expression of Cav2.2 in DRG cell bodies studied in tissue culture, as 15 minutes of peptide treatment did not just reduce the Cav2.2-mediated component of calcium current but completely eliminated it. 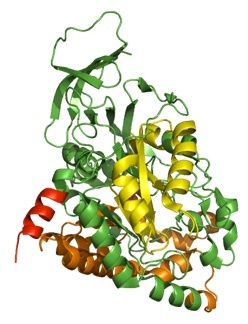 Whether such complete inhibition also occurs in synaptic terminals remains to be seen. Another important question concerns the effects of long-term application of the peptide or future small molecules that act in a similar way. All of the effects in the paper were studied after relatively short (< 4 hour) applications of the peptide. It is easy to imagine that adaptive or compensatory mechanisms might up-regulate calcium channel expression at longer times. Indeed, the effect of the peptide in a neuropathic pain model was smaller after 4 hours than after one hour. While this might be accounted for degradation or redistribution of the peptide, as suggested by the authors, it could also reflect compensatory mechanisms controlling calcium channel expression on a longer time scale. With regard to potential for clinical treatment of pain in human patients, the results in the paper are subject to the caveat of virtually all pain treatments studied in rat models, namely the very poor record of treatments in rat models translating to chronic pain in human patients, as discussed in the inaugural piece in the Forums by Jeffrey Mogil [Ed: see What is the Reason for Lack of Translation in the Pain Field?). Nevertheless, the paper is remarkable for introducing a completely new molecular target for possible pain therapies, and the data in rat models is truly spectacular for the size of the effects in pain models and for lack of serious side effects.